Coaches must be members of ICCA to have cheerleaders try out for the All-Star Cheerleading Squad. The ICCA is excited to join together with the Iowa Basketball Coaches Association to put together a great weekend featuring senior basketball players and talented cheerleaders. The cheer team is chosen through a video tryout process. A panel of cheer coaches choose cheerleaders to be members of the ICCA All-Star Squad. The fee for participating on the squad is $75. 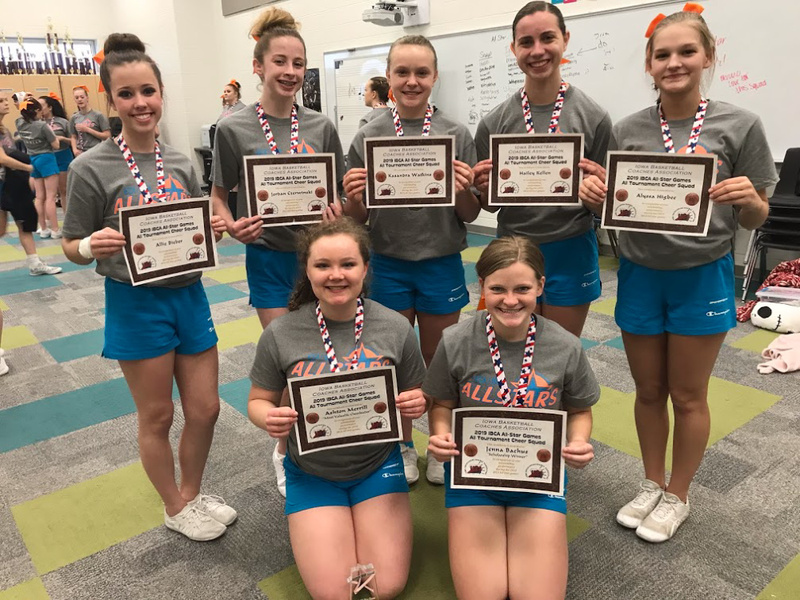 The All-Stars are sent a video from which to learn a choreographed routine which they will perform at Dallas Center-Grimes High School the end of March. Over the weekend the cheerleaders perform their choreographed routine at the half times of the Boys and Girls consolation and championship games. A practice will be held on March 22nd in Grimes, starting at a time to be announced. The performances will be on March 23rd, time to be announced. Please contact ICCA All-Star Director Betty Lou Jones jonesswea@iowatelecom.net with any questions. 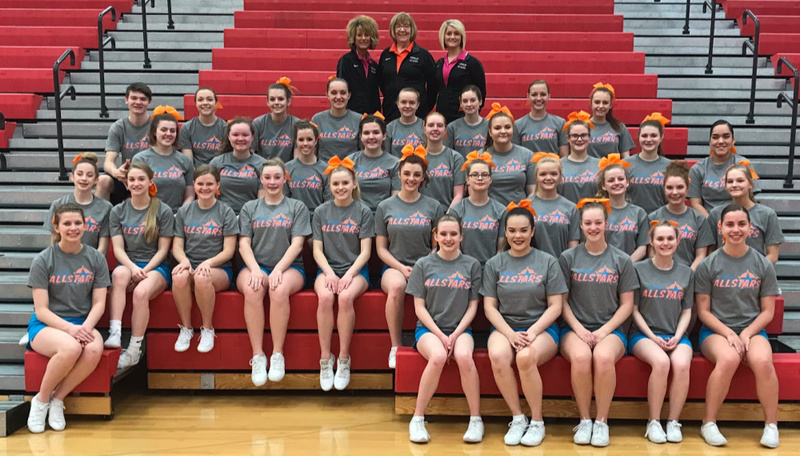 The Iowa Cheerleading Coaches’ Association in conjunction with the Iowa Basketball Coaches’ Association will select cheerleaders to be placed on the All-Star Cheer Squad to perform at the IBCA Basketball All-Star Tournament to be held March 23, 2019, at the Dallas-Center Grimes High School. A practice will be held on March 22, 2019 in Grimes (time to be announced). The cost if chosen to be a member is $75. Eligibility: Cheerleaders who are in good standing with his/her squad and school. Seniors will have first choice over underclassmen with like abilities. The cheerleader’s coach must be a member of ICCA. The coach is not required to attend. Information will be sent to cheerleading coaches in early December by e-mail. A tryout video will need to be submitted by January 15, 2019. 1. A coach’s recommendation, stating why this cheerleader should be chosen. 3. A video demonstrating cheering abilities. Video: The cheerleader must submit the following items on video. If possible, please send by e-mail or put on a private Youtube and send link. Tapes or DVDs will not be returned. 4. Video (tape, DVD, Youtube link or email), recommendation and form must be postmarked by January 15, 2019, to be considered. Send all requirements to Betty Lou Jones, Box 249, Swea City, Iowa 50590. Judging of videos will be done by ICCA Board Members and the All-Star Committee. The committee will review all videos submitted and make their decision based on skills and recommendation. All selections are final. The routine will be sent to the cheerleaders chosen and they must learn the material before they report to practice on the March 22, 2019 (time to be announced). For more information please contact Betty Lou Jones, e-mail jonesswea@iowatelecom.net or 515-272-4354. ICCA awards A $250 scholarship to one senior member of the All-Star squad. The senior is chosen by the All-Star coaches. The announcement will be made at the final performance. The following cheerleaders were chosen this year by video tryout to be members of the IBCA/ICCA All-Star Cheer Squad. The uniforms were furnished by GTM Sportswear.